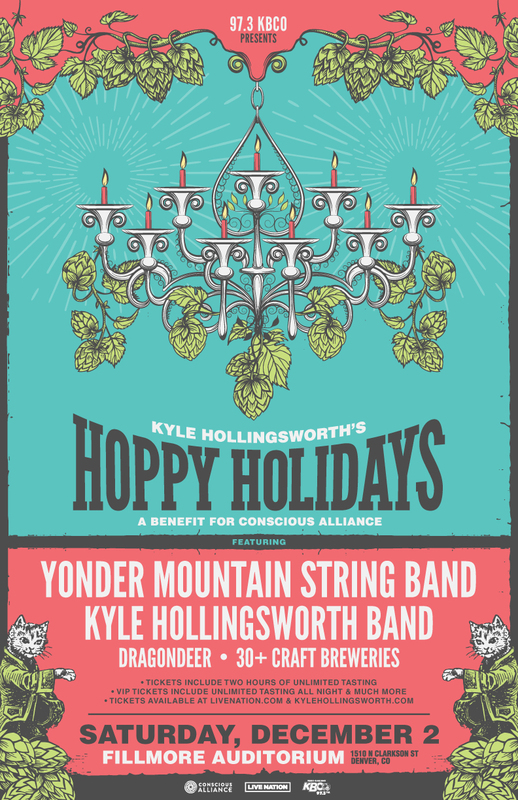 Kyle is back at it again with his annual Hoppy Holidays concert benefiting Conscious Alliance at Cervantes’ Masterpiece Ballroom in Denver on Saturday, December 8. Kyle will once again team up with the nonprofit organization Conscious Alliance to help provide food and funding to impoverished communities across the nation this holiday season. 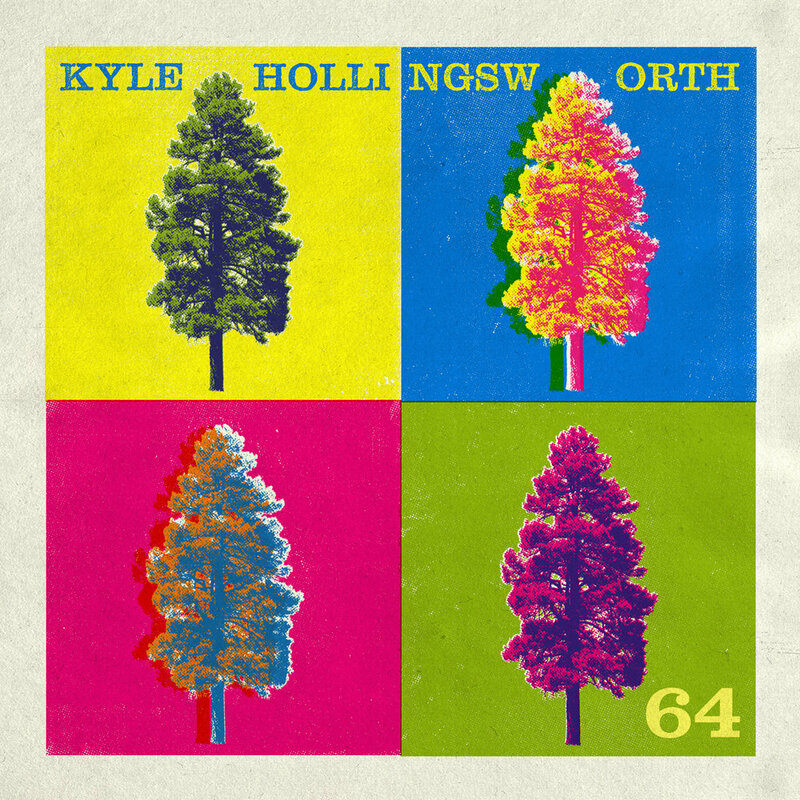 The event will feature performances from Kyle Hollingsworth Band plus Casual Commander (of Sunsquabi), Exmag, Tnertle (Album release party) and Nobide, as well as special collaborations from Kyle on tap and on stage. Tickets are on sale October 5 at CervantesMasterpiece.com and KyleHollingsworth.com. 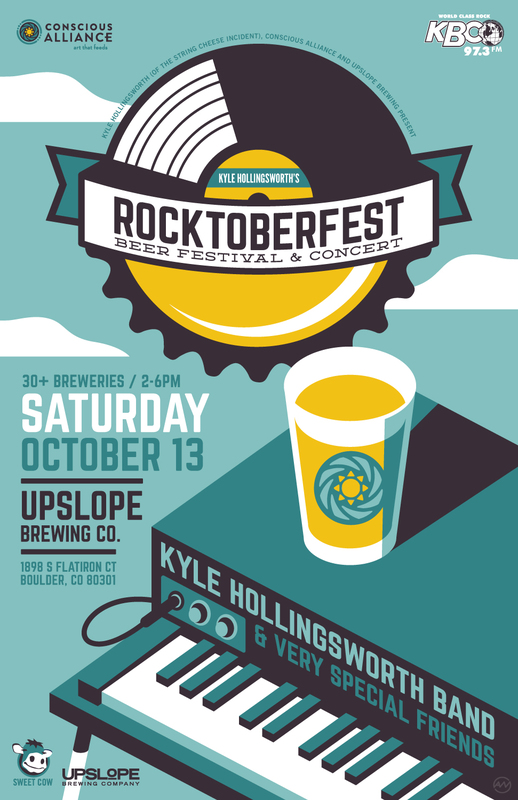 For the first time ever, on Saturday, October 13th, at Upslope Brewing Company in Boulder, CO, Kyle Hollingsworth Band and other very special friends will treat fans to a beer festival and concert with a selection of more than 60 craft beers from more than 30 breweries. The event will also feature exclusive collaboration brews from Kyle and select breweries. VIP tickets are also available providing fans early entry, tasting with Kyle, private brewery tour with Kyle, limited edition pin and more! Brand New SCI Track: "The Big Reveal"
I'm so excited to share this with you!...The latest release from The Lab is here! “The Big Reveal,” a tune I wrote with Keith. I hope you enjoy. Exile Brewing Co., The Motet and KHB in Des Moines this August! Great beer and great music in Iowa, heck yeah! KHB joins a free concert series this Labor Day weekend in Steamboat Springs, CO! Unfortunately due to a death in the family, Joel is unable to perform this weekend. We all greatly apologize. While we have been looking forward to this collaboration, the shows will continue to rock with Kyle Hollingsworth Band and Crosseyed & Phishless. Kyle would like to buy you a beer though (and one for Joel soon too). Chicago will feature a free keg available while supplies last and all attendees in Milwaukee will receive a free voucher for beer or non-alcoholic drink. Grand Rapids tickets, which are only available at the door, have been lowered to $10, so we can save you some beer money. 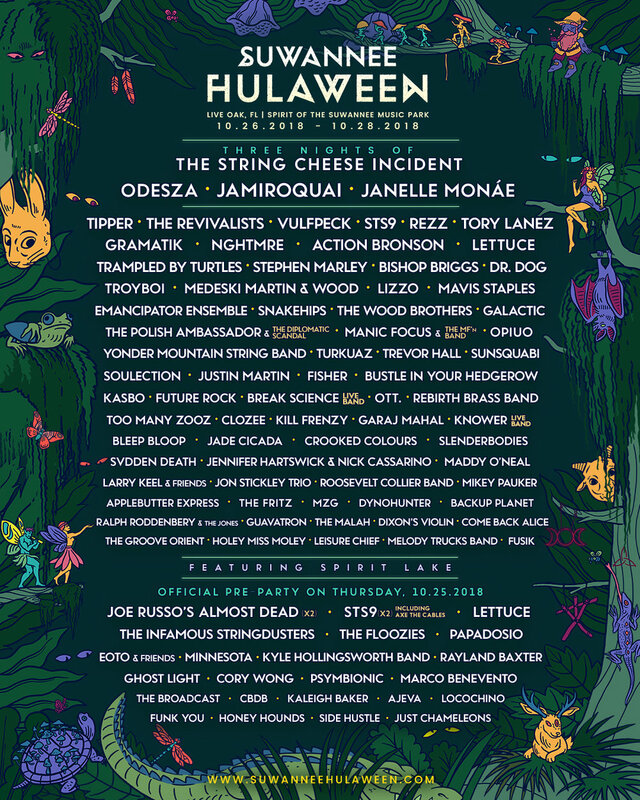 All attendees to all three shows will also receive a free raffle ticket for chance to win a 3-day GA pass to Summer Camp Music Festival or 3-day GA pass to Suwanee Hulaween. Ticket holders who would like refunds in Chicago and Milwaukee (Grand Rapids tickets sold at door only) will be able to find those options at the point of purchase (TicketFly.com), but we hope you choose to rage on with us. Following recent celebration of Kyle Hollingsworth's 50th birthday, new information has come to light, proving inaccuracies in the keyboardist's date of birth. 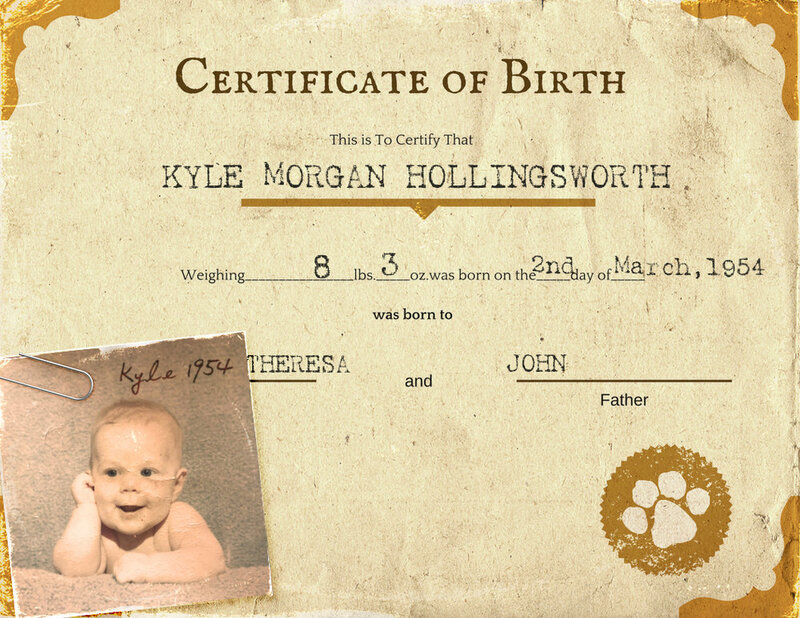 Maryland records have produced a birth certificate of Kyle Morgan Hollingsworth from March 2, 1954 - 14 years earlier than previously recognized. Born in Baltimore, the member of The String Cheese Incident insists he is younger than bandmate Bill Nershi. "It's shocking, even to me. There's just no way I'm older than Billy," Hollingsworth claims, still reeling with the news. 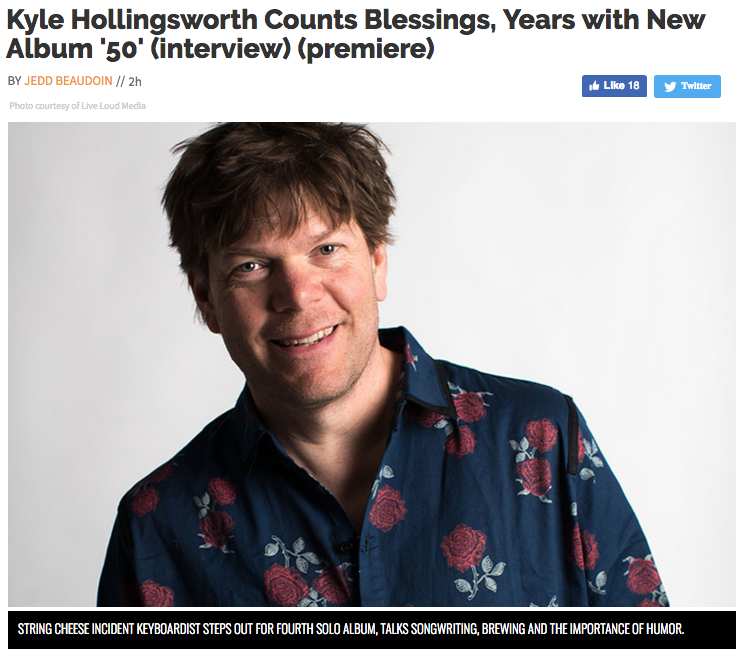 Less than a month after his supposed 50th birthday and the release of his fourth solo album, respectively titled 50, Hollingsworth has been forced to recall all of his CDs and vinyl records. Replacement is offered in a statement from SCI Fidelity Records, "We apologize to all of our loyal fans. All CDs and vinyl records must be returned at the point of purchase, where we are excited provide the updated album 64. It's everything 50 offered, plus 28% more." Apologizing to fans and colleagues, Hollingsworth pleads, “I had no idea I could get older than I already am. I guess it's just the speed of life." In celebration of my new album "50" dropping this Friday 3/2, pieces of KHB live session from SiriusXM Radio will air all week on The Jam Files on SiriusXM Jam On (SiriusXM channel 29 / Dish Network channel 6029). Check out PopMatters' premiere of "Stuff" from my upcoming album, 50, available everywhere March 2. Check out Billboard Magazine for the premiere of my second track release from my upcoming album "50." Head over to Relix Magazine for the premiere of the first track release from my upcoming album "50." Kyle's 50th Birthday & Album Release Parties! Kyle's 50th Birthday, Album Release Parties with KHB featuring many friends & influences of years passed. Ready to get back to the Colorado mountains with KHB next month! Cycles kicks off each night. Stay tuned for pre-order information. KHB in Southeast this October! Woo hoo I love the Southeast! What a great center of supercharged fans. We always have such an amazing time there, psyched to return! Back with another limited edition Kyle's Corner Feline Fine, signature cat shirt, ONLY available at Kyle's Brew Fest 7/20 and Red Rocks 7/21-23, while they last! Highlighting my recent infamous wrist cast with the beckoning sushi cat wave! Get your paws on these while you can, may the good luck cat be on your side!